A record seventh-wicket stand between Kent’s century-making captain Sam Northeast and all-rounder Adam Ball brought the hosts back into contention on the opening day of their Specsavers County Championship game with Division 2 rivals Derbyshire. The East Midland’s side dominated the opening three hours of the day in reducing Kent to 96 for four, only for Northeast to lead his team’s fightback with an unbeaten 173 that that took the hosts in at stumps on a creditable 354 for seven. Northeast featured in two noteworthy stands, adding 71 in tandem with Darren Stevens before combing with Ball, making his home debut for the season, to post 150 in 36 overs before Ball finally perished for 66 – just four short of his career-best. Fielding after the first uncontested toss on this famous old ground, Derbyshire made their opening breakthrough after 50 minutes through rookie paceman Will Davis. In only his third first-class appearance, claimed the scalp of New Zealand Test opener Tom Latham, leg before for 14, as the left-hander missed an attempted leg-side clip to make it 30 for one. Four runs later Sean Dickson, who hit a career-best unbeaten 207 in the reverse fixture at Derby in May, ran himself out for 15. Pushing to cover point, the right-hander set off for a risky single but lost the race with Wayne Madsen’s direct hit to the non-striker’s end. The hosts re-grouped thereafter as Joe Denly and Sam Northeast batted through to the first interval, adding 34 runs in the process. Four balls after lunch Joe Denly drove at his first ball of the session from Davis and was sent packing for 24 when umpire Neil Bainton upheld Tom Poynton’s appeal for a catch at the wicket. Denly’s funereal walk off implied the batsmen felt he had not edged the delivery. His replacement Alex Blake moved to 11 off 21 balls but then shouldered arms to a Tony Palladino off-cutter to go lbw and leave Kent in dire straits on 90 for four. 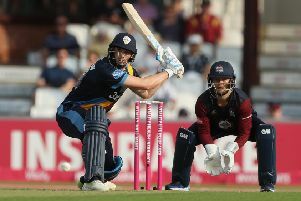 Kent’s veteran beneficiary Darren Stevens looked out of sorts in reaching 10, but settled his nerves by launching into an extra cover drive against Chesney Hughes to clear the ropes in front of the Knott-Underwood Stand. In the next over Kent captain Sam Northeast moved past 50 for only the second time in the county championship this season, reaching the milestone from 93-balls and with five fours. Northeast and Stevens added 71 for the fifth-wicket in 16.4 overs and appeared in little trouble until the return of the impressive Davis, who soon found Stevens’ outside edge for Hughes to pull off a tumbling catch to his right at slip. Sam Billings, playing his maiden first-class innings of the summer, had reached only four when he made a late decision to withdraw the bat against Palladino only to deflect the ball onto his own off stump. Ball came in for his third championship knock of campaign - all of which have been against Derbyshire - and soon looked in good touch helping Northeast to post their side’s first batting bonus point on the cusp of tea. Northeast posted his second championship hundred of the summer and the 13th of his first-class career soon after tea with a single to mid-on. It came after 224 minutes, off 159 balls and included 11 fours. A six into the top tier of the Colin Cowdrey stand helped Kent to a second batting bonus point and Ball to move past his season’s best of 40 scored in the game in Derby and on to his 50 from 94 balls. Derbyshire took the second new ball at 5.30pm with Kent on 285 for six but Ball and Northeast marched on to a third batting bonus point, creating a new seventh-wicket stand for Kent matches against Derbyshire in the proves after going past the 139 set by Steve Marsh and Mark Ealham at Derby in 1994. The pair took the score on to 316 before Ball was caught on the crease by another Palladino in-ducker that ended his 122-ball stay lbw and gave Derbyshire their seventh and final success of the day.